The energy-efficient Forest Hills Municipal Building. Photo courtesy of Pfaffmann + Associates. When people think of green buildings, their minds probably run toward the sweeping glass roof of Phipps Conservatory and Botanical Gardens or the sci-fi sleekness of the David L. Lawrence Convention Center. But according to Angelica Ciranni, a project manager with the Green Building Alliance (GBA), energy-efficient designs can be much more modest, like family homes in Larimer or the cafeteria at the University of Pittsburgh. Ciranni, who serves as director of Pittsburgh’s District 2030 challenge, says it’s this practical but civic-minded approach that has made Pittsburgh a national leader in green design. The District 2030 challenge is a national, grassroots movement meant to connect and support property owners and businesses as they work to cut back their use of utilities. The goal? Cut their emissions and water use by 50 percent by the year 2030. With 78.7 million square feet of real estate committed to the challenge, Pittsburgh is by far the nation’s largest 2030 District. The next closest city, Seattle, is at 45 million square feet. In fact, Pittsburgh represents nearly a quarter of the total commercial building space of the entire 2030 District Network, which includes cities such as Toronto, San Francisco, Los Angeles and Detroit. While the point of the project is for the private industry to volunteer their efforts and come up with their own approaches, Ciranni says that one of the main parts of her work is creating networks and spaces for building owners and operators to work together and share expertise. Their partners include PNC, which recycles rainwater and uses natural climate control at its offices Downtown. Another partner is the Pittsburgh Penguins, who built PPG Paints Arena to emphasize natural lighting and high-efficiency ventilation systems. The arena was the first LEED gold-certified major sports venue in the nation. The best part? The 2030 challenge has even become something of a virtuous circle. As Pittsburgh becomes known for practical, common sense approaches to green design, it has begun to attract architects working on even more aggressive approaches to cutting emissions. One of those designers is Nathan St. Germain, a New York transplant and expert in passive houses. 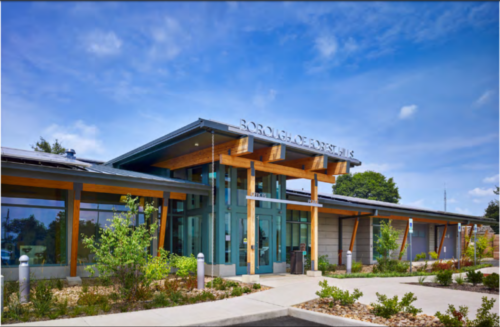 While most green buildings simply strive to use utilities more efficiently, a passive house draws heating, cooling and even light from the surrounding climate. The energy savings is dramatic. In addition to his own work at the Sewickley-based Studio St. Germain, he is also the co-founder of the group Passive House Western PA. Much like the GBA, the group works to connect and support businesses in the region embracing passive house design. To many experts, most impressive of all is the way Pittsburgh has managed to turn older, iconic buildings into regional leaders in sustainability. There’s the mighty U.S. Steel building, which was built in 1971 and is the tallest skyscraper between Philadelphia and Chicago. Since 2010, the building’s energy usage has dropped by 40 percent thanks to innovations designed by evolveEA in partnership with the building’s tenants. These innovations include highly efficient LED lighting, low-flush toilets and smart elevator systems that power down lights and ventilation when the cabin is empty. Together, these innovations have earned the building an Energy Star certification two years in a row. There’s also the Children’s Museum’s new museumlab wing, which is being built inside a century-old Carnegie Library building on the North Side. The construction uses a special plaster made with ground cork to better insulate the space, along with eco-friendly insulation in the roofing and windows. 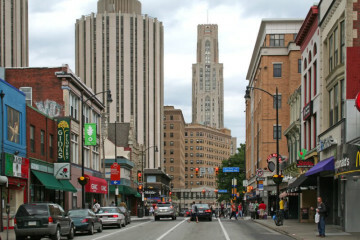 “Keeping those buildings relevant keeps us Pittsburgh,” says Anna Siefken, executive director of the Wilton E. Scott Institute for Energy Innovation at Carnegie Mellon. While the progress is bold and significant, experts point out that more work still needs to be done. St. Germain says while pushing for high standards on new construction is important, these projects only account for about 20 percent of the construction work happening in a given year. The other 80 percent is the simple renovation and remodeling of homes and small businesses, which must be done with energy efficiency in mind. This article was underwritten by Peoples Gas as part of the Energy series in NEXTpittsburgh. Read all energy stories here.